Your app is eventually going to need code, which you write using the Xojo programming language in the built-in Code Editor. Code can be attached to almost any item that is in your project, including windows, web pages, controls, classes, modules and more. To maximize typing speed in the Code Editor, you should close the Find/Errors/Messages panel when it is not in use. Typing in the Code Editor can force the panel to update so that it shows changed code and this can slow down typing in large projects. You can think of the Code Editor as a text editor that is specially designed for writing Xojo code. It has many features that make it easy for you to program in Xojo. The Code Editor highlights your source code for you as you type. You can change the default colors for things such as keywords, string, integers, comments and more in Preferences. 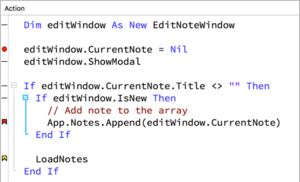 The Code Editor automatically indents your code as you type it. Code such as If...Then, While/Do loops, Select...Case and other commands that group code are indented for you automatically. Code that is indented is referred to as a code block. In the Code Editor, you can see that code blocks have a small “-” sign to their left. When you hover over the "-", the code block lines are highlighted to better identify the code block. You can click the "-" to collapse the code block (changing it to a “+’), hiding all the code within it to make your other code easier to read. The code will still run and is part of your project; it is just not visible in the Code Editor. Click the “+” to expand a code block. Click on the vertical line connecting the code block to select all the code in the block. Expanding and collapsing code is a great way to hide code that you do not need to see when focusing on other code. As you are typing in the Code Editor you will often see an ellipsis (three small dots) that appears after the text you are typing. This indicates that the Code Editor has some auto-complete suggestions for you. When you see the ellipsis, press the tab key to display a list of available commands that can be auto-completed. The auto-completion is smart and only tries to show you commands that are relevant based on the context of your code. Auto-complete may also show you the remaining part of the text you are typing (in gray). Press tab to have the text fill in automatically. This can be much faster than typing out the name manually, especially if you have long variable, class or method names. There is a small area at the bottom of the code editor that is used to display syntax help. The Syntax Help Area displays the line number, column number, syntax information, method signatures, declarations and other information about the code that is under the mouse cursor. The gutter on the left side of the Code Editor is used to set breakpoints and bookmarks. A breakpoint is a line of code that will stop execution when your app is run in the debugger. A bookmark is a quick way to jump to specific code. Next to each line of code, you will see a dash (“-”) in the gutter indicating that this is a line that can have a breakpoint or bookmark. Click on the dash to toggle a breakpoint on or off. A breakpoint is indicated by a red circle. Option-click on MacOS (or Control-click on Windows/Linux) to toggle a bookmark on or off. A bookmark is indicated by a bookmark icon. If you have both a breakpoint and a bookmark set for the line, the indicator appears as a red bookmark icon. The Project ↠ Breakpoint menu has menu items to turn a breakpoint on or off, show all the breakpoints or remove all the breakpoints. Similarly, Project ↠ Bookmarks has menu items to turn a bookmark on or off, show all the bookmarks or remove all the bookmarks. When you Show All bookmarks or breakpoints, they appear in the Find panel at the bottom of the Workspace. In addition to displaying breakpoints and bookmarks, the gutter can also show line numbers when you've clicked the Line Numbers button on the command bar. Provides the usual cut, copy, paste and delete functionality. Selects all the text in the code editor. Comments (or uncomments) the selected code using the comment character you have specified in Coding Preferences. Opens the Color Selector window and allows you to choose a color, which is added to the code editor as a color literal. Jumps to the definition of the selected item in the code editor. This works for variables, methods, classes and any other item you have created in your project. You can also quickly jump by double-clicking on a variable, method, class while holding down the command key (MacOS) or control key (Windows and Linux). Switches to another event, method or property. Applies standard formatting rules to the selected text, which case-corrects keywords for you. This can be configured in Coding Preferences. Wraps the selected code in an If Then / End If code block. Wraps the selected code in a Do / Loop code block. Wraps the selected code in a While / Wend code block. Wraps the selected code in a For / Next code block. Wraps the selected code in a conditional compilation block that omits the code from the build. Moves the selected code to its own method and switches you to the method so you can specify its name, parameters and return value. Displays a dialog that lets you create a constant from the selected text. 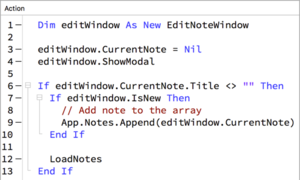 Creates a new method using the selected method as the method name. If you have supplied parameters, their types are automatically added to the method definition. For method calls without parameters, you'll need to include (and select) blank parenthesis in order for this option to be enabled in the menu. When cutting and pasting code, sometimes invisible ASCII characters can confuse the code editor. Use this command to clean up the selected text. Turns the Break Point for the current line on or off. Opens the Documentation window. If the command at the cursor is recognized as a Xojo command, then “Help for” appears, allowing you to jump directly to its entry in the documentation. While working in the code editor, there are several keyboard shortcuts that will help make you more productive. Shift + Return: Completes the code block. For example, typing “If True” and pressing Ctrl + Return will automatically fill in the “Then” and the “End If” and place the cursor between them. This works for other code blocks such as Select, While, Do, For, #If, etc. Ctrl + Enter (Option-Enter on MacOS): Extends code to a new line by automatically adding the “_” character. Ctrl + \ (⌘-\): Toggles the breakpoint on the line on or off. Ctrl + ' (⌘-'): Comments or uncomments the selected code lines or the line the cursor is on if no code is selected. Also refer to the Full Keyboard Shortcuts. This button is grouped with View Code and is a toggle. When viewing code, you can click this button to quickly switch back to the Layout Editor to see the last item you were working on. This button is grouped with View Layout and is a toggle. When viewing code, this button is selected. When not viewing code, you can click this button to quickly switch back to the Code Editor to see the last item you were editing. Use this button to comment out the selected code in the code editor. If no code is selected, then the current line is commented out. If the code is already commented, then this will uncomment the code. This uses the comment character you have specified in Coding Preferences. Use this button to toggle the display of line numbers in the gutter to the left of the code editor as shown above. Use Analyze Item to validate the source code for the current project item. Analyze checks the project item for compile errors and warnings (such as unused variables). Refer to Analyzing the Project for more information.